For the past three weeks I’ve been participating in a generative poetry workshop through O, Miami with wonderful poet and human, Mahogany Browne (#blackgirlmagic). The workshop’s focus is “Nature and the Socio-Political Body” and the work being produced by the poets has been outstanding so far. This Thursday, March 7th our workshop is having a finale reading at The Betsy in Miami Beach. I’ll be reading new work! Spread over 8 weeks in the months of Sept. and Oct., the O, Miami “Write and Publish Your Own Chapbook” workshop explored the chapbook in all it’s forms, gave participants a chance to generate poetry with thoughtful prompts and readings, and time together to workshop poems in preparation for publication. Literally, the moment I found out about the O, Miami Chapbook Workshop, I signed up. I have been thinking about publishing a chapbook for a long time now. I have several groups of poems that I have already written, and ideas for poems that I could write, to potentially include in several different chapbooks. This workshop helped me dedicate time and commit to making one chapbook a reality. That in itself was priceless. Our instructor, Caroline Cabrera, did an outstanding job of leading us down a path to learning and understanding what our chapbooks could be- one major facet of our workshop was that by the end of the 8 weeks we were going to have a 12-page chapbook, printed and bound, all of our very own. The workshop gave us the opportunity to not just generate new work, but also workshop our poems with the other poets in the group. We each workshopped three poems, one every other week. Discussions were lead by Caroline, who was an excellent moderator and helped guide us as we discussed each poem. Thankfully, we really gelled as a group and learned a lot from each other. All of this unleashed a wave of creativity and inspiration that I think we all felt – every night after class I got back home and wanted to write and read poetry all night long, my brain firing in all kinds of creative directions. Another excellent aspect of the workshop was the ability to focus on one idea or theme in our poetry, and begin to carry that through to a finished product. Beginning with the first week of the workshop, Caroline brought her personal collection of chapbooks to share with us by lending them out. Seeing how different poets approach this medium is fascinating and liberating. A chapbook is a world unto itself- a journey into the mind of each poet. I wish I had more time to read more of them 🙂 But my takeaway was that I could envision my chapbook as it’s own little world, and that has translated into a laser-like focus that I am still learning from. There truly is nothing like holding a book of your own words in your hands. Our finished products were designed by Phil, Caroline’s husband, who took great care and creativity in laying out the covers and pages. It’s one thing to run copies of your own poetry off of your printer, but it’s a totally different experience to see them laid out, looking book-professional and official. Thank you, Phil! We each produced 10 copies of our finished product. Since our chapbooks are part of a series for our class, we decided to call it the Category Six Chapbook Series (thanks to Hurricane Irma which hit during the second week of class). They are similar in cover design, but we were encouraged to embellish them in any way we want to. From seeing Caroline’s collection of chapbooks, I knew that I wanted a little color and some more tactile elements, so I included some end papers and a ribbon bookmark in mine. In several of my poems I use the phrase green-gold, so my end papers are gold vellum, and my ribbon bookmark is thin green satin. I think they look beautiful! All of the participants also received the PDF file of their chapbook so they can print up more copies if they wanted to. Some of the poets in the workshop are selling their chapbooks. I gave away 8 copies of my chapbook and kept 2 for my family. I am not going to print any additional copies, mainly because I already have worked some more on those poems and am submitting them to literary magazines and poetry contests. This workshop was one of the best experiences in my entire life. It jump-started my chapbook, which eventually is going to grow into a book-length collection of poems. I now have a manuscript that I am going to work on over the summer at the Bread Loaf Environmental Writer’s Conference in Ripton, Vermont. My goal is not only to expand the collection, but also to use that manuscript to apply to MFA programs for Fall 2019. 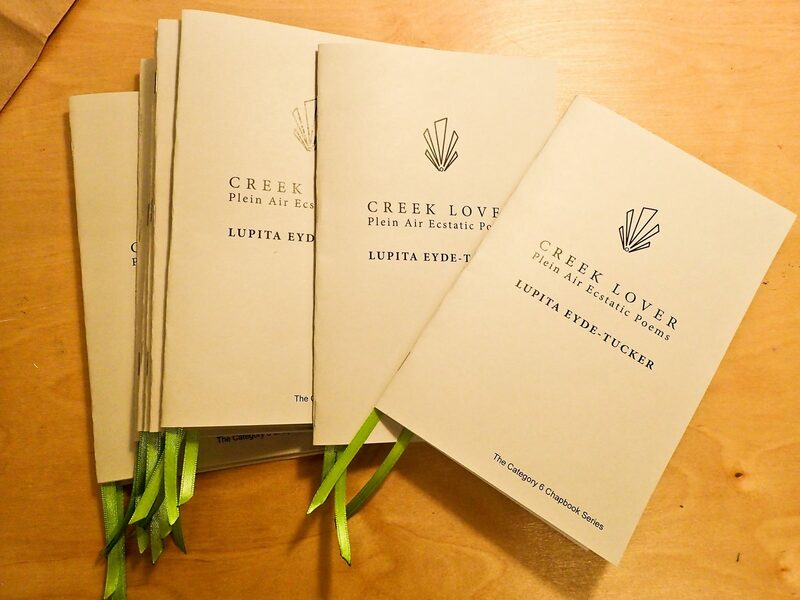 Creek Lover – my 12 page chapbook of plein air ecstatic poetry.